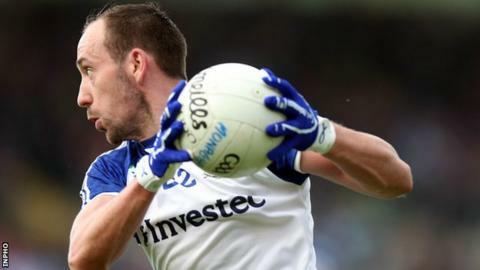 In-form midfelder Gavin Doogan will miss Monaghan's Division Two league final against Donegal at Croke Park on 27 April because of a broken foot. Doogan sustained the injury while playing for his club Magheracloone against Latton on Saturday and has been ruled out for six weeks. He could also be a doubt for the Farney county's Ulster SFC quarter-final with Tyrone or Down in eight weeks' time. Monaghan's good form has already seen them promoted from Division One. Scotstown brothers Kieran and Darren Hughes both sat out Saturday's round of club games, as did Latton pair Owen Lennon and Owen Duffy, plus Clontibret's Dessie Mone. Manager Malachy O'Rourke, who has guided the county to successive promotions, will hope that all those key players will be available for the Division Two decider with Jim McGuinness's side. When last year's Ulster finalists met in Letterkenny at the start of the 2014 League campaign, Donegal proved too strong.